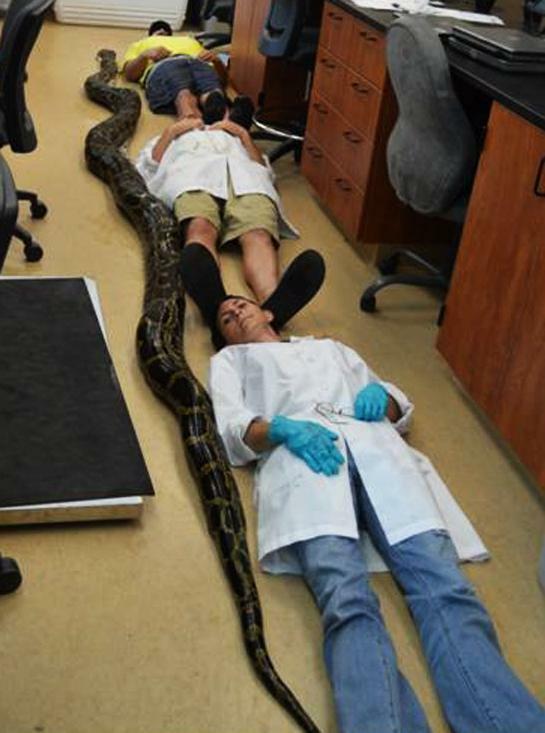 GIANT Python Caught in Florida – WOW! South Florida Water Management District workers captured a Burmese python that measured an astronomical 18 ½ feet and weighed 150 pounds. The invasive species was basking on a levee about 30 miles west of the town of Krome, five miles north of the Tamiami Trail. This, of course, is only the latest invasive monster to come from the Sunshine State. A recent study showed that the snakes have decimated portions of the Everglades by reducing the number of medium-sized mammals such as possums, bobcats, and raccoons by 99 percent. The reptiles are also fond of birds and larger animals such as deer and even alligators. The largest snake taken prior to that was a 164-pound behemoth that measured 17 feet, 7 inches. The snake caught Tuesday by water workers has been sent to University of Florida where researchers will determine if the animal was carrying any eggs. 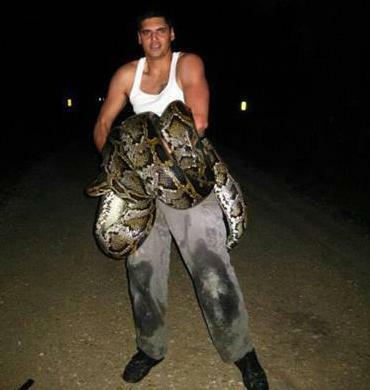 Last May, Miami resident Jason Leon killed an 18-foot 8-inch python he caught crossing a road at night. Mr. Leon killed the serpent with a knife as it wrapped tighter and tighter around his leg. That snake is considered to be the longest ever taken in the state. So what did he do? He wrestled the beast, knowing it was an invasive species, and eventually decapitated it with a knife. Would you tangle with an 18-foot constrictor in the name of conservation?